Wintersday is coming fellow Tyrians and, during the recent AMA, I made reference to a small balance update and I wished to follow-up to let you know that we're aiming to release that update next Tuesday, 12/12. We've heard your frustrations with the burstiness of conditions invalidating power builds across game modes (though for differing reasons in each). Conditions have always been intended as a way to achieve strong sustained damage once it has ramped up. Pushing damaging burst condition toward ramping, sustained damage. This should create more opportunities for counterplay, but also feel satisfying to keep conditions rolling once you’ve ramped them up. - i.e. We’re tuning some skills that apply damaging conditions so that they apply less stacks up front, but last for longer. In total duration they’re almost the same before and after. - e.g. Purging Flames: Burning has been adjusted from 3 stacks for 5 seconds to 2 stacks for 8 seconds. Re-vamping several passive vulnerability traits to offer more distinct opportunities or create synergy with other traits (rather than being standalone). At small amounts vulnerability doesn’t feel good and adding more vulnerability to something that is capped on it has little value. These changes will offer chances to spike up vulnerability when it is ebbing or encourage new build styles. As always, we’ll be looking for your feedback once you have had a chance to play with the upcoming changes. We’ll start a post here after December 12th to hear your thoughts, so please prepare your most constructive feedback. See you in the lands! Will there be any adjustments made to winds of disenchantment or enchantment collapse? Anything happening with full potential deadeye?...or is the current deadeye the full potential deadeye? Is it currently in its final form?...or is it not even its final form? I'd like to ask this in advance because i don't ever see it being addressed otherwise. Is vamperism (life-leech) ever going to be functionally worth it ? Right now and basically for the majority of it's life its been an under-tuned mechanic and under explored as far as a unique way of dealing and sustaining through damage. Where it works well often becomes abuse cases rapid hits. Ideally i'd like to see it function as an additional packet of damage and healing proportionally to damage dealt (with substantial bonuses for investing in healing power) so that slower weapons can also have an impact with this combat mechanic that is largely underutilized. No changes needed, bubble is fine as it is. It's your fault if you're not anticipating where they will bubble and moving/dodging out of the way properly. These are some good changes indeed. especially the first one with the condis is a great idea. A good way to nerf the condi dmg. The issue was that till you cleanse the conditions you had , you already received big amount of damage . Now at least you will have the time to react and now have dozens of stacks on you . GREAT idea guys. Are you going to buff necro dps in PvE already? Tired of not being accepted in groups. I really wish you'd discuss in detail what the plans are seeing as how Tuesday is not so far away and possibly avoid some issues that I could see arising. Balance is such a difficult fickle thing and I just don't over nerfs to happen. I do for the record appreciate the heads up, just wish there was more detailed discussions on what is changing. Well there goes any hope I had of Mirage being saved. e.g. Purging Flames: Burning has been adjusted from 3 stacks for 5 seconds to 2 stacks for 8 seconds. I'd like the passives I have (reaper) to actually be utilized in DS. It is going to be a pretty big nerf on bosses that have phases where they go invulnerable/immune for awhile or completely clear conditions. Basically this is going to further widen the gap between Ele/DH stacking on bosses like KC. I am pretty concerned about this. Of course I don't know the full balance changes so I could be mistaken, but wouldn't the proposed chage to Mutilate Defenses destroy the synergy it already has with the other Devastation traits (namely Targeted Destruction and Focused Siphoning) especially in AoE situations? Edit: there was also talk of allowing your utilities/healing/elite work while in shroud form - maybe that will help? I must second that motion for updates on the Deadeye. As it stands, the elite spec is widely regarded as useless in every game mode. Several good suggestions on rebalance have been made on the forums and there was huge disappointment when the recent balance patch, if anything, was only cosmetic or actually negative for the profession. If another balance patch takes place with no major improvements or reworks on things like malice generation or kneel, then the deadeye may as well be outright removed from the game, as that's the impact it is realistically having on any play areas. That's a real shame, as its a much desired, thematically strong concept that many people created characters for. make necromancer, reaper and scourge great again. buff scourge by removing icd in demonic lore only in PvE! boost power reaper because it's still weakest power build there's. make base necro in general stronger in both power and condi to make necro good in pve. pvp and wvw don't touch 'em. only boost in pve. Scourge is owning the new raid so its not all that bad.....? Can you somehow make sure Weaver doesn't get nerfed in the process? That kitten is already hard enough to play. The vulnerability changes sound more like a nerf, given the example. You say that applying a few stacks feels like nothing but then a trait that let ppl permanently put a few stacks of vulnerability on a foe is replaced with one that ... only gives a few stacks (5 = "At small amounts vulnerability doesn’t feel good") and only recharges once in a blue moon (elite skills, even if rev can use them a lot more often that other professions). If playstyle must become "apply vulneability => use best dps skills", then the corresponding traits should be a lot better (10-15 instead of 5 in the example). This is exactly what ranger's LB#3 did long ago (10 stacks, and no elite skill condition) before it was turned into a stealth skill (oh the memories of always using it before the burst of #2 or before swapping to GS). Also, it would be nice to have some mechanic to cater for "adding more vulnerability to something that is capped on it has little value", unless the whole point of the update is to make sure that normal play will never ever reach 25 stacks anymore except in organized raids where ppl make sure they coordinate to have 25 in their combined builds ... but in this case you'd have to cater for a huge dps loss and buff everything else. I really hope this can be a time to review severally really underperforming condition weapons with exceedingly low abilities to stack longer lasting conditions. Mesmer Staff (auto: remove vulnerability or make it always apply vul + damage condition each hit) Chaos Storm needs to always applg a damage condition per pulse as well, and chaos armor needs a rework. Mesmer ambushes: literally every ambush needs to have their condition durations significantly lengthened to make infinite horizon a legitimate build option. Worst recently added offender is Renegade Shortbow. The conditions are pitifully low duration even with max condition duration. Similarly, renegades kalla utility that stacks a ton of short duration bleeds could be condenssd with a longer duration and less frequent application (hopefully for a realistic net slight boost). Id love for a short bow renegade playstyle to actually be viable. Id love for the build up ramping condi playstyle to be viable on these weapons as well. Their aoe nature should not necessarily mean they have to deal abysmal single target damage. Unfortunately I know that we won't receive any more responses from you guys in this thread. But I have to say that this first change you listed is a huge step in the right direction. I will wait to see how its carried out, but it is a step in the right direction. Along with that, you guys really should look at how many conditions are being applied period. Hopefully Necro will see some love in PvE, they're already underperforming as it is, they don't need to get nerfed further. Necro ramp up time in PvE is really slow compared to other condis classes, and it doesn't help that condi cleanses actually hurt our dps because we can't transfer condis we apply to ourselves. Just give Necros SOMETHING for a change. Someone already mentioned to remove the ICD on Demonic Lore in PvE only, that would help immensely. If vulnerability boosts condi dmg output, weakness should reduce condi dmg output too. Really looking forward to this! Thanks ANET! Shoot me if you've heard this idea before: what if power builds were the most reliable way to apply vulnerability? So you can stack a full condi team if you want, but their vulnerability application is going to be pretty bad; likewise a full power team isn't necessarily going to deal as much as a condi team (unless they're weavers or holosmiths) but their vulnerability isn't going to run out any time soon. Except this doesn't really change anything to help that because some power builds are simply just BAD right now. In other words, my favorite Reaper builds are getting nerfed again. Why did I buy this expac? Please for the love of god, split this "Balance Update" into PvE and PvP. I know the condi burst is just ridiculous in PvP but don't balance PvE around PvP again. For the part that's targeted at PvE content, the main issue here is not condi builds being overwhelmingly strong, but power builds being underwhelmingly weak and this should be where you start to balance, by adding power to weak builds and not by nerfing the in comparison stronger builds to the ground. Winds of Disenchantment is fine when it is alone. If you don't move out of the bubble, you will likely die, referring to WvW of course. When there are 5, 6, 7 or even 8 spellbreakers sequentially dropping them to blanket an entire tower, it's absolutely game breaking as there is no dodge to get you out of that and no counter to stop them. There should be a re-think on how this skill works or some drawback to using it in these situations. Maybe make one Wind of Disenchantment cancel out another. Is that new trait called "Expose Defenses" because you waste all your energy to use it and are left with nothing to defend yourself? How about a rework to most of the Engi's base? Engi has been stuck with the same meta builds for years even with the intro of elite specs. Would love to see anything without kits as viable in fracs/raids. They could also do more split balancing. Well I mean if they literally nerf all damage by 25% across all game modes at some future date (who knows maybe they don’t want dungeons to be facerolled) then they can do a relatively simple reduction to boss health numbers. It won’t make much difference, doing 10k dps to a boss with 100k health takes 10s as does doing 7.5k dps to a 75k health boss, no mechanics are skipped, the boss doesn’t get easier, it stays the same if done right. Hi Irenio, thanks for communicating with us on this matter. Is there anything in the works to address how conditions work in WvW? 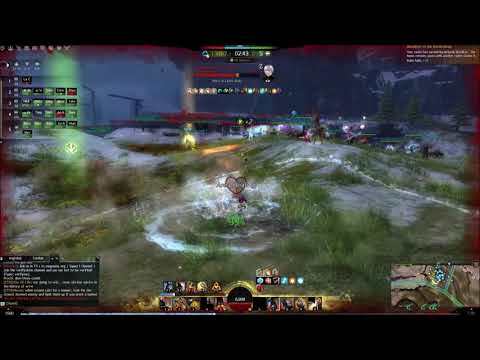 By and large we understand that condition needs to be an equally viable option in all game modes, and with that view the buffs that have happened over the years make sense for PvP and PvE, but not for WvW. I actually feel that this sort of "nerf" would be unnecessary if there was a separation of how condition stacking and intensity worked in WvW, PvP was left alone, and PvE was buffed. In WvW we are stuck with the PvE scaling - meaning any one person can be hit with all 1500 stacks of every condition. Yes I realize this is likely to never happen, but when you're in a group bigger than 5 the probability of being hit by 3 of any condition class at the same time is significantly high. If one squad has 5 Necromancerss (which is a small amount of Necros for a big blob to have in the current meta) they can chuck 15 stacks of bleeding and torment on 5 people with one co-ordinated skill that ticks 37.5k damage over 3 seconds. Seems reasonable for PvE (mobs with millions of health and toughness stats) and for PvP, where the likelyhood of seeing a 5 Necro team is next to nil. But in WvW that's going to hit one person for 37,500 damage assuming they stand still and don't trigger the extra torment damage. What I'm looking for in the long run is some sort of separation to stacking and / or intensity for WvW in specific, maybe where conditions experience a diminishing return. The more conditions a target has the less effective they become, the more stacks of a single condition the less damage it does over time and/or per tick. Also some sort of stat separation for condition builds to give up something that either contributes to their damage or contributes to their survivability, which currently they don't have to do - it's quite easy to maximize condition damage and duration while also maintaining maximum vitality and toughness. Maximum power build output (power, precision, ferocity) requires giving up significant vitality and toughness. The power creep of the elite specs hasn't really allowed WvW to keep up. There aren't enough, or perhaps the right, combination of stats available to produce counter play options to either a condi meta or a power meta. Being insta-killed by 3 Rev's firing a CoR off at a single target isn't any better than being hit by one co-ordinated condi bomb. There seems to be a lack of health pool to provide room for counter play in group fights specifically. Small scale fights are mostly balanced around the PvP balancing but once the groups scale up the probability of counter play significantly diminishes regardless of damage type. I don't believe this is by design, so I'm hopeful it's something Anet is working on or at least willing to work on. Of course it won't be easy. Nothing worthwhile ever is. why they do not enhance direct attacks and reduce the damage of the conditions? 5 years ago that is taking advantage of the conditions, and today is not even play, just throwing all the conditions and run like a chicken. And also should limit the amount of conditions that a character can support, it can not be that you can apply all the conditions of the game at once. That is directly leaving the affected character without playing. Please keep doing small updates like this! Three months is far too long to wait for balance, and I think smaller updates that occur more regularly would be a better solution. I actually think this is a really eloquent solution to this problem. Right now the issue is that condi-burst is unavoidable and instant (and often ranged AOE, to boot). If we can slow that down, it would help balance a ton. Power should be for bursting, condis should be for sustain.